Pack up the kids and head to Cedar Circle Farm on Sunday, June 29, from 10 to 3 PM to enjoy this popular early-summer ritual, rain or shine! 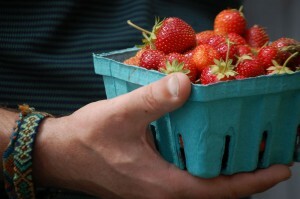 Now in its twelfth year, the Strawberry Festival offers fun for the whole family with kids’ activities, puppetry, juggling, live music, horse-drawn wagon rides, strawberry picking, and an organic “Good Food” concession. 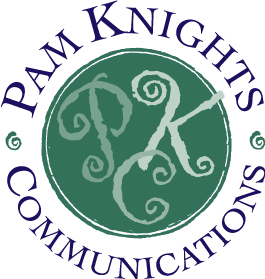 Since Pam Knights Communications started working with Cedar Circle Farm twelve years ago to launch the first strawberry festival, we’ve seen it grow to more than 1500 people of all ages from the Upper Valley and beyond. CCF’s staff, led by Education Coordinator Cat Buxton, has the coordination of the event down to a science. Assisted by up to 75 volunteers, the parking, food, children’s activities and waste recovery station run like a well-oiled machine. A Green Event, the festival typically yields but 2 bags of trash. Festival goers are encouraged to bring a plate, utensils and cup to help reduce waste. I never tire of going to the Strawberry Festival or for that matter to the Pumpkin Festival, coming up on Sunday, October 12. 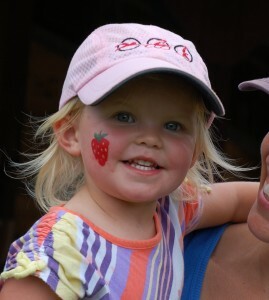 Families tend to spend a good portion of the day with multiple activities geared towards children, ongoing live music under the tent and horse-drawn wagon rides, and lots of yummy organic food grown on the farm and prepared for the most part by CCF Chef Allison Baker and her staff. This year’s activities include award-winning juggler Tony Duncan from Nimble Arts Productions in Brattleboro, VT who performs at 11, 12:30 and 1:45, and Puppeteer Gabriel Q from White River Junction who returns for two performances in the Circle of Cedars Enchanted Forest at 10:30 and 1. Live music is provided by two popular Upper Valley bands, The Stovepipe Mountain Band from 10 -12:15 and The Wall-Stiles from 12:45-3. 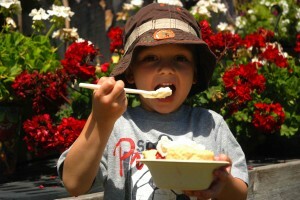 From 11 -3, the organic “Good Food” Concession offers strawberry shortcake with freshly whipped cream or Strafford Organic Creamery ice cream; strawberry sundaes; strawberry smoothies (dairy & dairy-free); grilled Hogwash Farm sausages; veggie burgers; farm fresh salads with strawberry vinaigrette; café cookies; strawberry lemonade; kid-friendly strawberry-lemonade popsicles; and NOFA-VT’s wood-fired pizzas made with the farm’s fresh veggies. Raffle tickets are sold to raise funds for CSA food shares for limited income Vermonters through the Farm Share Program subsidized by NOFA-VT and Cedar Circle Farm. The farmstand and coffee shop are also open until 5 PM. COME BY BICYCLE OR ON FOOT & GET IN FREE! Parking is available in designated fields for $10 per car, and carpooling is encouraged. Those coming by bicycle or on foot get in free! All pets need to be left at home. Cedar Circle Farm is a forty-acre certified organic farm, dedicated to “growing for a sustainable future” through the production of certified organic vegetables and berries, bedding plants, and quality flowers and herbs. The farm offers a CSA program, harvest festivals, gardening workshops, cooking classes, and guided educational farm tours. CCF is located at 225 Pavillion Road, along the Connecticut River, just off of Rt. 5 in East Thetford, VT. For details and directions, visit www.cedarcirclefarm.org/events/festivals or call the farm at 802-785-4737.